Today, Public Safety Canada announced an Action Plan on Post-Traumatic Stress Injuries and we are proud that the Saskatchewan Director of the CVFSA, Shayne LaMontagne was able to represent the Association at this important event. 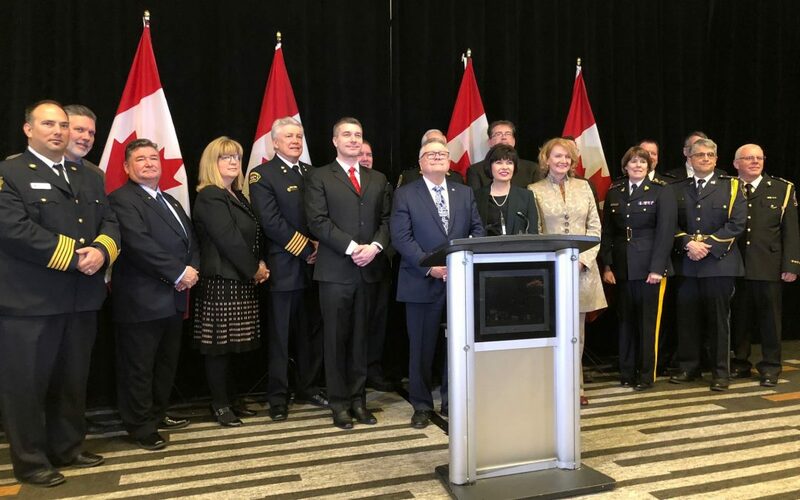 The Minister of Public Safety and Emergency Preparedness, the Honourable Ralph Goodale, and the Minister of Health, the Honourable Ginette Petitpas Taylor made the announcement in Ottawa flanked by leading representatives of Canada’s first-responder community. $20 million over five years to support a new National Research Consortium on PTSI among public safety personnel between the Canadian Institutes of Health Research (CIHR) and the Canadian Institute for Public Safety Research and Treatment (CIPSRT) of which $11 million in grant funding has already been announced. $10 million over five years, starting in 2018-19, for an Internet-based Cognitive Behavioural Therapy pilot to provide greater access to care and treatment for public safety personnel, especially in rural and remote areas. $10 million toward a longitudinal study of the mental health of RCMP new recruits that will help develop appropriate mental wellness and remedial strategies for the Force and other emergency response organizations. Public Safety Canada also launched the Memorial Grant Program in 2018 which recognizes the service and sacrifice of first responders who have died as a direct result of carrying out their duties, including death resulting from an operational stress injury. The Action Plan was developed with the involvement of a wide range of public safety organizations, other levels of government, academia, union representatives, mental health professionals and non-governmental organizations. More details about the announcement can be found here.